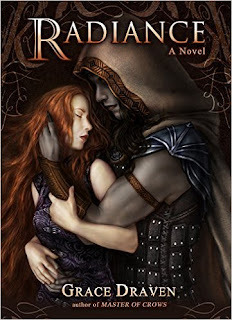 Radiance (Wraith Kings Book 1) by Grace Draven. Brishen Khaskem, prince of the Kai, has lived content as the nonessential spare heir to a throne secured many times over. A trade and political alliance between the human kingdom of Gaur and the Kai kingdom of Bast-Haradis requires that he marry a Gauri woman to seal the treaty. Always a dutiful son, Brishen agrees to the marriage and discovers his bride is as ugly as he expected and more beautiful than he could have imagined. Ildiko, niece of the Gauri king, has always known her only worth to the royal family lay in a strategic marriage. Resigned to her fate, she is horrified to learn that her intended groom isn’t just a foreign aristocrat but the younger prince of a people neither familiar nor human. Bound to her new husband, Ildiko will leave behind all she’s known to embrace a man shrouded in darkness but with a soul forged by light. Two people brought together by the trappings of duty and politics will discover they are destined for each other, even as the powers of a hostile kingdom scheme to tear them apart. The story is a bit like Romeo and Juliet, in that you have two sets of people who have an extreme dislike/fear of each other. On one side there is the Gauri, who are basically humans, and then on the other side are the Kai, who are similar to humans, but have grey skin, claws and are more animalistic in their nature. Both sets of people however are seeking an alliance to defend themselves against a mutual enemy, and what better way then unifying the two kingdoms through marriage. Enter the Gauri King's orphaned niece, Idiko, and the 2nd son of the Kai King, prince Brishen. I thought the opening chapter was compelling, and instantly drew me into what was a brilliant fantasy romance book. Idiko, the niece, and Brishen, the prince, instantly developed a believable connection between each other, and despite how ugly they found each other, both characters infused light hearted humour into their relationship which I enjoyed reading. I did fear this book would turn into one of those cliche romantic books, where there's plot twists only to drive the (eye-rolling) romance between the characters, however, the author managed to get the right blend between the romance and fantasy, with some interesting plot ideas. Overall I enjoyed the storyline, just as much as the two main characters, who both felt real and relatable. I could actually envision their interaction in my mind, something that I can't say too often about when I read romantic fantasy novels. So, if romance is not your thing, then you still might want to give this book a try, as there is other aspects to this story, such as action, political scheming and magic. But if you do enjoy a healthy dose of romance in your fantasy, then I can't recommend this book highly enough.